by Mitu Gulati and Robert E. Scott. Chicago and London: The University of Chicago Press, 2012. 232 pp. Cloth $ 35.00. ISBN: 9780226924380. Reviewed by Margaret Jane Radin, University of Michigan Law School. E-mail: mjradin [at] umich.edu. "Boilerplate" is a semi-colloquial word referring to terms in a contract that are not changeable by participants in a transaction (e.g., Radin, 2012). In transactions involving a firm on one side and a consumer on the other, consumers are recipients of fine print on a “take-it-or-leave it” basis: you either sign on the dotted line or click “I Agree,” or you cannot do business with that particular firm. But what about boilerplate that occurs in large-scale commercial transactions between financially sophisticated parties? Consumer boilerplate has long been a topic of interest both to legal scholars and to consumer interest groups, but until now commercial boilerplate has not been. Previous legal scholarship has largely taken it to be the case that sophisticated commercial parties know what they are doing, and that they negotiate contractual deals based upon their own needs and cognizant risk assessment. The result is that it is often recommended that judges reviewing such contracts pay paramount attention to the intended meaning of the parties represented by the language of the contract they entered into. Thus, this mode of analysis urges judges to stick to the plain meaning of the documents before them and not rely on legal doctrines that limit or reinterpret the documents. In The 3-1/2 Minute Transaction, Mitu Gulati and Robert Scott appear to be opening a different line of inquiry and thought about commercial boilerplate. The 3-1/2 Minute Transaction presents both a theoretical and empirical investigation of a particular instance of “sticky” boilerplate that has been of great interest to the world of sovereign debt. (The term refers to bonds issued by sovereigns; that is, borrowing by governments.) A commercial court in Brussels in 2000 delivered an unexpected interpretation of an obscure clause occurring in almost all sovereign bond contracts, the pari passu clause. The unexpected interpretation caused a “hold-out” creditor (one that refused to consent to a restructuring of the bond debt it was holding) nevertheless to reap a large gain when the court interpreted the clause as meaning that all creditors must be on the same footing, whether holdout or not, so that the bond issuer was precluded from making a payout to some of its bondholders without paying the holdout. It was widely believed by players in the sovereign bond field – specialist attorneys, underwriters, and issuers – that this interpretation of the clause was wrong. Yet after this decision, the same old clause – dating from the nineteenth century – kept reappearing in bond contracts. The contracts were not rewritten to disavow [*303] the wrong interpretation; the pari passu clause was “sticky.” It is this puzzle that Gulati and Scott investigate. Gulati and Scott carried out an extensive empirical investigation on several fronts. They analyzed every bond contract they could obtain, going back to the early 19th century, amounting to over 1000 of them, seeking to find out where and how the pari passu clause originated (and in the end, they remained unsure). They interviewed many attorneys and others whose customary work is in sovereign bond issues, and asked them what they thought the clause meant (the respondents didn’t really know) and why it had not been changed after the troublesome interpretation in Brussels (the respondents gave varying answers that did not satisfy the authors). The theoretical part of this book is particularly valuable. Many legal writers have tended to assume that recurrent boilerplate must be economically efficient because parties keep using it. The authors here commendably do not follow this pattern. Instead, in a chapter that amounts to an outstanding intellectual effort, they outline ten possible explanations for the stickiness of the pari passu clause. Gulati and Scott group the possible explanations for stickiness into two categories: five explanations that would reflect a plausibly efficient situation for the boilerplate users (though overall efficiency would also depend on other characteristics of the market in which the stickiness occurs), and five explanations that would reflect an inefficient situation. Thus, they claim that one type of theory will “explain stickiness as a rational response to either the perceived benefits of retaining the standardized form or the expected costs of revision” and the other type of theory will “explain stickiness as an inefficient byproduct of an underlying agency problem” (p.34). Among the “rational response” theories are network externalities and satisficing. Among the “agency costs” theories are herd behavior and cognitive biases. In the heart of the book, the authors explore, with care and insight, the question whether any of these ten theories fits the facts their research revealed. They deserve praise for attempting to fit economic explanations to empirical data, rather than just making theoretical pronouncements. Because sticky boilerplate appears to be quite common, this book can be understood as adumbrating a new paradigm of contract interpretation. 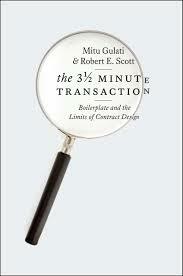 One of the co-authors of The 3-1/2 Minute Transaction, Mitu Gulati, in an earlier article co-authored with Stephen Choi, having already researched this episode with the pari passu clause, suggested that some commercial boilerplate should be interpreted not according to what the two parties to the contract intended, but rather according to what the boilerplate originally meant to those who first drafted and used it. This was presented as a statutory style of interpretation (Choi and Gulati 2006) – though we would have to accept a simple kind of “originalism” in order to accept that this is how statutes are interpreted. The other co-author of this book, Robert Scott, in earlier work apparently adhered to the idea that each clause in a contract between sophisticated commercial parties should be interpreted according to the intent of the two parties to the contract (Schwartz and Scott 2003). Apparently Scott no longer fully adheres to this traditional view, at least now admitting an exception to it. Although this book does not endorse Gulati’s suggestion that sticky boilerplate should be interpreted like a statute, it does suggest avenues of understanding and interpretation of contractual terms other than the intent of the parties – at least for sticky boilerplate terms. The 3-1/2 Minute Transaction should be of interest to an audience wider than the elite financial coterie interested in the stickiness of the pari passu clause in sovereign bonds. The ten possible explanations for stickiness will be of interest to those who are interested generally in the economic analysis of boilerplate, because these explanations can and should be considered with respect to other instances of sticky boilerplate, of which there seem to be many. The description of the agency costs of “big law” will be of interest to students of the sociology of the legal profession and its organizational forms. Finally, this book begins to step away from the traditional view that every clause in a commercial contract between sophisticated parties represents part of a deal between two parties which must be interpreted according to those parties’ intentions. That initial step away from the traditional view is an idea that is of potentially quite broad interest; it could be the start of something big. Choi, Stephen J., and Gulati, G. Mitu. 2006. “Contract as Statute,”Michigan Law Review 104: 1129-1173. Radin, Margaret Jane. 2012. Boilerplate: The Fine Print, Vanishing Rights, and the Rule of Law. Princeton: Princeton University Press. Schwartz, Alan, and Scott, Robert E. 2003. “Contract Theory and the Limits of Contract Law,” Yale Law Journal 113: 541-619. Copyright 2013 by the Author, Margaret Jane Radin.